I, like many Japanese learners, have always struggled with identifying Japanese verb groups. Usually this information is presented in long, and boring, tables. For visual learners, like me, the best way of to describe abstract concepts is with a graph. So I set out to create, The Japanese Grammar Road Map. This roadmap will provide you to visually navigate Japanese grammar. 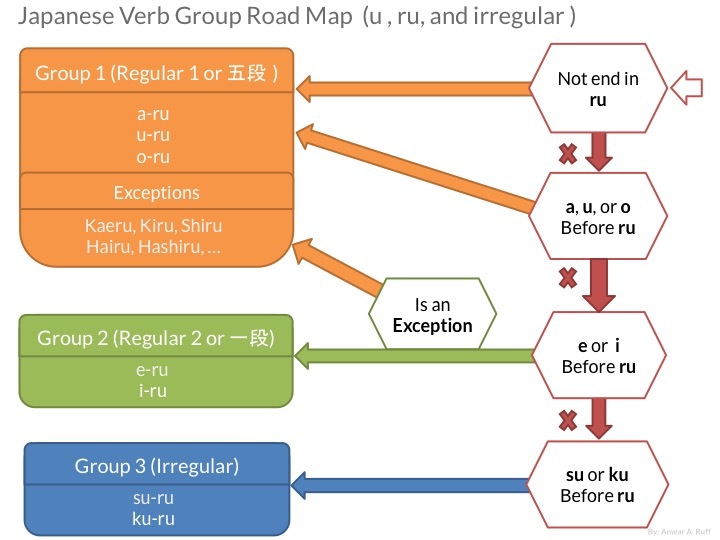 The first in this series is the Verb Group Identification Map (i.e., for u (う), ru (る), and irregular verbs). To use the map start from the grey arrow at the top right, and move left if the answer is yes, down if no. Lets say you want to find the verb group for kaeru (かえる). We start our path through the road map from the right most grey arrow. Does kae-ru not end in ru? No, it does in in ru, so we go down the red arrow (for no answers). Is there an a, u, or o before the ru in ka-e-ru? No. So we go down the red arrow. Is there a e or i before ru in ka-e-ru? Yes, so we go left. Is this an exception? Yes, which we can see from exceptions list, so we move go Group 1. I wish you the best of luck with you ongoing Japanese studies!